All Hornady Custom pistol ammo is loaded with either the famous Hornady XTP (Extreme Terminal Performance) bullet, our fully-encapsulated FMJ or our new FTX bullet. All are supremely accurate, and deliver maximum knockdown power. 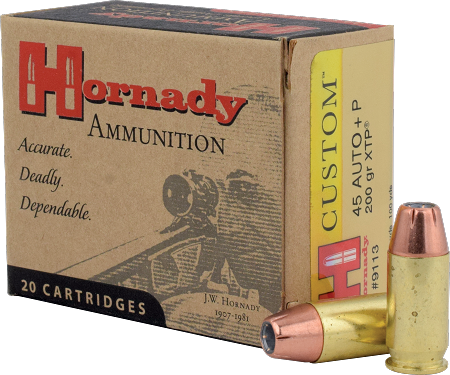 Depending on the caliber, Hornady handgun ammunition is loaded with Hornady XTP, FMJ-RN, XTP Mag, FTX or FP-XTP bullets.